In the history of Pakistan’s judiciary, no Chief Justice has played such an important role as he did when he started corruption investigations against Nawaz Sharif and others. He was a protégé of Pakistan’s Establishment (Army and ISI) and did exactly what was told to him by them. He was the 25th Chief Justice of Pakistan – Justice Mian Saqib Nisar — who retired on Thursday. In the history of Pakistan’s judiciary, no Chief Justice has played such an important role as he did to start corruption investigations against Nawaz Sharif, his brother and former Punjab Chief Minister Shahbaz Sharif, his daughter Maryam Nawaz, his son-in- law Capt Mohammad Safdar, Pakistan People’s Party leader and former President Asif Ali Zardari, his sister Faryal Talpur, Pakistan Tehreek-e-Insaf leader Jahangir Khan Tareen, Punjab Minister Aleem Khan, former Defence and Foreign Minister Khwaza Asif and former Railway Minister Khwaja Saad Rafique and many others. He even heard cases against Imran Khan and his elder sister Aleema Khan and passed pertinent orders. He overstepped his jurisdiction and oversaw the construction of Diamer Basha and Mohammad dams and created a Fund for them. He started checking hospitals and supervising social development programmes, including population growth policies. 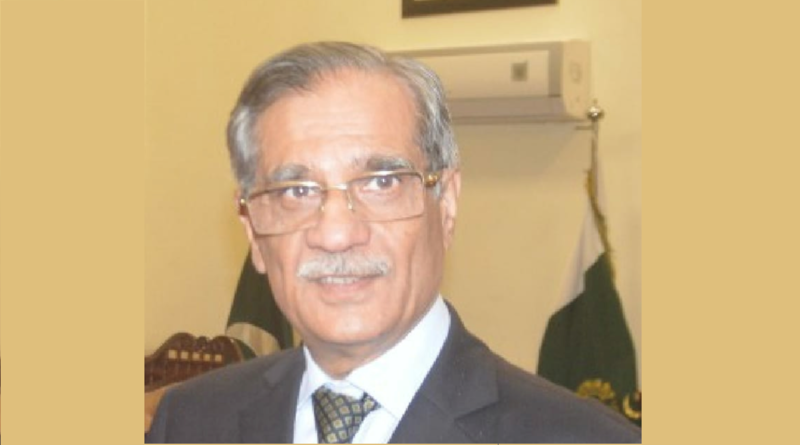 Justice Saqib Nisar challenged one of the foundational principles of democratic constitutional theory, according to which the judiciary’s role in executive and legislative affairs is circumscribed. Justice Nisar used his suo motu powers expansively and initiated cases on issues that he considered to be of pressing concern. He devised remedies also. Any role played by human rights activists, civil society groups or the affected public was largely muted. The effect of Justice Nisar’s court has been perceived as undermining political institutions either by assuming the role and responsibility of political branches or by openly displaying contempt towards elected officials and civil bureaucrats. Justice Nisar’s interference with executive and legislative affairs exposed what many would consider the questionable side of judicial activism and its threat to the evolution of democracy in Pakistan. Saqib Nisar was born on 18 January 1954 in Lahore. His father Mian Nisar was an advocate who belonged to an Arain family of Lahore. His father later became a Judge of Lahore High Court. Nisar was educated at the Cathedral High School there, from where he matriculated and enrolled in the famous Government College in Lahore. He graduated with a B.A. degree in 1977 and attended the Punjab University where he secured an L.L.B in 1980. In 1982, he enrolled as an advocate of the Lahore High Court. On 29 March 1997, he was appointed as Law Secretary at the Ministry of Justice and Law (MoJL) – a chief bureaucratic position inside the law and justice ministry. His appointment as the Law Secretary of Pakistan was confirmed by Prime Minister Nawaz Sharif immediately after being elected in general elections held in 1997. His appointment marked the first instance of someone from the Bar being appointed to such a post. He became a Judge of the Supreme Court on 19 February 2010 and Chief Justice on 31 December 2016. In fact on 13 February 2010, his nomination to be elevated as Judge of the Supreme Court was initially rejected by then-President Asif Ali Zardari in spite of the recommendation made by Chief Justice Iftikhar Muhammad Chaudhry. President Zardari instead elevated Justice K.M. Sharif and appointed Justice Nisar as acting Chief Justice of Lahore High Court. Upon hearing of these developments, Chief Justice Chaudhry suspended the appointment order and marked the actions as “unconstitutional”, using his constitutional powers granted by the Judicial Commission. The Supreme Court of Pakistan’s authority to review legislative and executive action to assess whether it is consistent with the Constitution is well established, but in traditional democratic constitutions, the judiciary restrains itself from playing a prominent role in executive and legislative affairs. Judicial overreach that undercuts the democratic branches is not desirable. In new and fragile democracies, however, courts tend to exercise more influence over other branches of government, reflecting the recognition that these institutions may not have the capacity or willingness to enforce fundamental human rights and provide public services equitably and transparently. Article 199 and Article 184(3) of the Constitution of Pakistan gives superior judiciary the authority to make orders to enforce fundamental rights. While an expansive judicial role may be correct in some cases, these contexts are also most vulnerable to the stifling effects of judicial overreach. Where the judiciary positions itself as a replacement of political branches of government, it runs the risk of stunting the growth of these institutions, and where the judiciary repeatedly shames the executive branch, it threatens to discredit democratic institutions. In such circumstances, judicial activism may actually serve to promote the backsliding of fragile democracies towards authoritarianism, which is arguably what was witnessed in Pakistan since the lead up to the rigged elections of 2018. Despite being a close ally of the Establishment, Justice Nisar will still be remembered as somebody who confronted corrupt politicians and punished them mercilessly with the powerful Army’s consent. But every journey ends one day.